To a large extent feeding any dog is trail and error and Lab puppies are no exception. Of course for the first three of four weeks of its life a puppy will be weaned by its mum with most breeders beginning to feed their dogs after four weeks. Some breeders remove the pups mum at this stage to encourage the puppy to learn just to accept food rather than mothers milk. Other breeders will let nature take its course and wait for mum to get fed up producing milk for Lab puppies whose teeth are getting sharper by the day! When you first take your pup home you need to decide their diet. This is no easy thing as there is a mountain of different foods in the shops and also as many different opinions on what a puppy should be fed. Most Lab puppies will be taken home for the first time at around 7-8 weeks and at this age their teeth will be developed enough to eat dry food comfortably. If your pup arrives before their teeth have quite developed enough to enjoy dry food than any proprietary food watered down to a soup like substance should be sufficient for the puppy. 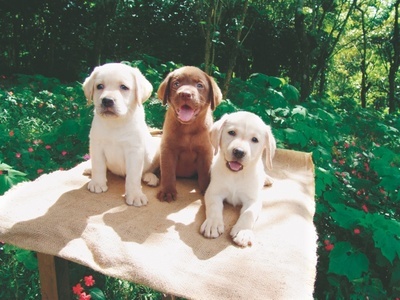 When Lab puppies begin eating dry food it is essential that they have lots of fresh water always available. You may find that a pup doesn’t take much notice of the water to begin with but he will soon learn why water is important and will start to drink like a drain. Choosing the dry food for your pup is very much a matter of personal choice; firstly yours in which brand you buy and secondly your pups in whether he decides to eat it or not! A word of warning about feeding a pup is to be very careful that the food isn’t too rich. There is a tendency amongst owners of pups to go overboard when thinking about protein. Most dried puppy food will have more than enough protein and calcium yet owners will insist on adding ‘nutritional supplements’ to their dog’s diet. There is no need to do this and in fact if a Labradors diet is too rich it can lead to deformity caused by the bones growing too fast because of the extra protein being absorbed by the dog. Most puppy food packaging will tell you to continue feeding the pup on the food for a year before switching to an adult formula. But, most people agree, that the switch should happen much earlier at four months whilst others say puppies should be fed on a good quality adult food right from the start. Plenty of water and a good quality dried food is the ideal starter diet for your dog. A pup is usually fed three times a day to begin with the number of feeds being reduced as the pup grows up to eventually only having one feed a day. At least that is what most experts suggest. But, as I said at the start of the article, feeding any dog is very much a case of trial and error. My personal experience with Lab puppies has led to a different feeding regime in our household. We leave dried food out all day long for the dogs (one still a puppy) to help themselves whenever they are hungry and then give them a canned dog food in the evening. This probably goes against most advice but I find it works great for our Labradors. But, again, its all a question of trial and error. Also look for AAFCO (Association of American Feed Control Officials) certification. This means that the food was manufactured to an exacting set of standards. Look for the phrases "complete & balanced," "total nutrition," or "100 percent nutritious." Don't be afraid to save money. Consumer Reports reported that the store brands from Wal-Mart and Target had the lowest prices for high quality foods.